One of the most popular video game franchises ever receives another deluxe hardcover! 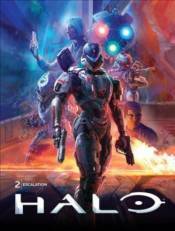 In this volume, follow the UNSC Spartans as they attempt to halt Dr. Catherine Halsey and Jul 'Mdama's pursuit of the Janus Key-the fate of the entire galaxy depends on them! This volume collects Halo: Escalation #13-24 and features a cover gallery, annotations, and behind-the-scenes extras! � The conclusion of Escalation in a deluxe, oversized hardcover! � Features exclusive annotations! � Includes a cover gallery and behind-the-scenes extras!